TEL: 0034 911 012 522,&FAX : 0034-911 817 664. BATCH NUMBER:PS/1305/05/BQJ. ; ; Date. 03-04-08. This is to inform you of the release of the âUROMILLONES LOTTERY INTERNATIONAL Program held on the 21st , DECEMBER, 2007 Due to the mix up of numbers, address and the holidays, the results were released on the 02th APRIL,2008. 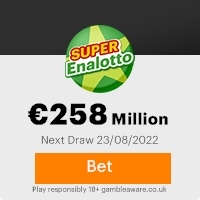 Your name attached to ticket number, G-777-2400-007-X with serial number 7216-05 drew the lucky numbers of 26-37-61-79-63-45 which consequently won the lottery in the 3rd category. You have therefore been approved for a lump sum payout of â 785.790.00 (SEVEN HUNDRED AND EIGHTY FIVE THOUSAND SEVEN HUNDRED AND NINTY EUROS ONLY ) in cash credited to file with Ref. NÂ. EM/76841284672/6. This is from a total cash prize of 13,770,050.00 Million Euros( THIRTEEN MILLION SEVEN HUNDRED AND SEVENTY THOUSAND,AND FIFTY EUROS ONLY) Shared among the twelve international winners in there respective category. CONGRATULATIONS!!! Your fund has been deposited with BANK OF ESPAÃA. and COMPREHENSIVELY INSURED IN YOUR NAME. For some security reasons, we ask that you keep this award from public notice until your claim has been processed and money remitted to your account as this is part of our security protocol to avoid double claiming or unwarranted taking advantage of this program by participants as it has happened in the past. Names entered in the program were presented by ANDALUCIA VISTA S.A, in conjunction with a group of philanthropist, humanitarian organizations, and also with the help of chambers of commerce of high commission worldwide. (six million) names from Asia, Australia, New Zealand, Europe, North and South America Middle East and Africa as part of our International promotion program. We hope your lucky name will draw a bigger cash prize in the subsequent programs. To begin your lottery claim, please contact your claiming agent SÃR.PAUL CARLOS. Foreign operation manager GROUPAMA SEGUROS. S. A. on Tel: 0034-911 013369 ,&Fax: 0034-911 311 721. for the processing and remittance of your winning prize money to a designation of your choice. Remember all prize money must be claimed not later than 25th APRIL. 2008. After this date, all funds will be returned as unclaimed to the MINISTERIO DE ECONOMIA Y HACIENDA. And also be informed that 10% of your Lottery Winning belongs to (TELEKOM PROMOTION COMPANY). Because they are the promotion company that bought your ticket and played the lottery on your name, this ten percent will be remitted after you have received your winnings because the money is insured in your name already. Previous: Attn: Prize WinnerFresh ScamsNext: 2008winner!!! This Email with the Subject "Fwd: FINAL AWARD NOTIFICATION" was received in one of Scamdex's honeypot email accounts on Fri, 04 Apr 2008 19:20:37 -0700 and has been classified as a Generic Scam Email. The sender shows as sytalp@aol.com, although that address was probably spoofed. We recommend that you do not attempt to contact any persons or organizations referenced in this email, as you may expose yourself to scammers and, at the very least, you will be added to their email address lists for spam purposes.